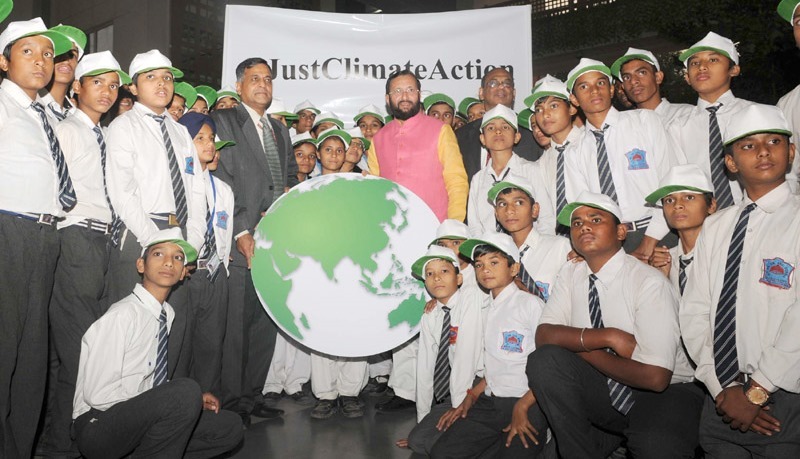 A group of select school children presenting a symbolic Globe as best wishes, to the Minister of State for Environment, Forest and Climate Change, Shri Prakash Javadekar, in New Delhi on November 27, 2015. The Secretary, Ministry of Environment, Forest and Climate Change, Shri Ashok Lavasa is also seen. In a unique gesture, around 50 school children extended good wishes to the Indian delegation for Conference of Parties (COP21) – the global climate conference to be held in Paris. The children presented a symbolic globe to the Environment Minister, who is heading the delegation for Paris. The message on the globe read, “We Trust and Believe in You to ensure the Best”. Speaking on the occasion, Union Minister of Environment, Forest and Climate Change, Shri Prakash Javadekar, said that India is going to Paris with a progressive and a constructive approach. “The world needs to allow development space and growth space to developing countries like India. If we grow, justice will be delivered to the poor. If we grow, the market and world economy will grow and to that end, there will be more accommodation for the developing world in Paris”, he said. Shri Javadekar added that we are hopeful that there will be a “just and an equitable” agreement in Paris. He emphasized that India has taken positive steps under the leadership of the Prime Minister, Shri Narendra Modi, not only in renewable energy, but in clean environment, clean energy, clean water, clean air and more green. The Minister also said that the world has appreciated India’s Intended Nationally Determined Contribution (INDC). COP21 will start in Paris from November 30-December 11, 2015. The objective of the Paris Conference is to achieve a legally binding and universal agreement on climate, from all nations of the world.